When Janice Wood began working as part of the culinary team at Stonewall Jackson Youth Development Center in Concord, NC this past year, she figured her days would be spent prepping meals for the 100 students. In fact, she never would have guessed that in just a short year, she would earn USDA Best Practice Award for Child Nutrition, nor did she predict that the one acre vegetable garden and aquaponics system implemented by 100 Gardens would play such a significant role in her kitchen. At the beginning of the school year, students at SJYDC spent a class period at the garden and aquaponics system with 100 Gardens team member Sam Fleming, where together they would plant and harvest produce for Meals on Wheels. Soon, the class was harvesting too much food for the charity to utilize, which could have led to major waste. When the students instead offered the surplus to Janice and the cafeteria staff, she was delighted. That evening, the student’s dinners included fresh vegetables they had grown themselves. After seeing how excitement in the cafeteria as students ate the locally sourced meals, Janice decided to add the garden vegetables to her cooking whenever she could. Soon, the kids were bringing Janice their harvest often, leading to mouth-watering meals of squash casserole, veggie pizza, and even eggplant Parmesan. She recalls overhearing the students tell their friends that they had cooked the very tomatoes and cucumbers in their salads, which made Janice feel proud of their hard work. “It makes me feel good that they feel good about it,” she explained. She realized that Stonewall was the only Youth Development center with a farm and garden in North Carolina, so she decided to submit the school for the USDA Best Practice Award, a contest that involves all public schools and youth centers in state. When Janice received news that Stonewall Jackson had won, she was mostly excited for the kids to receive the honor. “It will be nice for them to stand out like that,” she said. It goes without saying: Janice Wood is the epitome of humble. She denies any praise towards her, explaining that the real hard workers are the students. Of course, Janice’s hard work in the kitchen is what truly allows the students to reap the rewards of their hard work—a lesson that will hopefully stay with them forever. On a normal day in Brandy Starnes’ fourth block class, you can expect to see dedicated students working on projects and completing daily tasks. You can also expect to see an advanced aquaponics system, a thriving greenhouse, pregnant goats, and a donkey named Ollie. These unconventional classroom components may seem strange, but it’s just another Tuesday afternoon to the students of the Animal Science II class (AS II) at South Iredell High School. 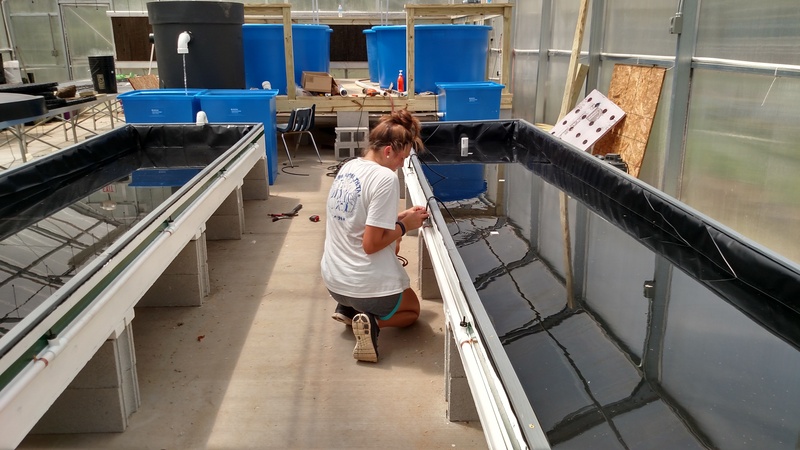 Brandy has worked with 100 Gardens to implement a state-of-the-art aquaponics system right outside of her classroom door in Troutman, North Carolina. Since its completion in August 2014, her students take inventory on the fish, analyze the water, and perform scheduled tests as part of the AS II curriculum. Along with livestock care and classroom assignments, this course focuses on the importance of sustainable living in the modern world. 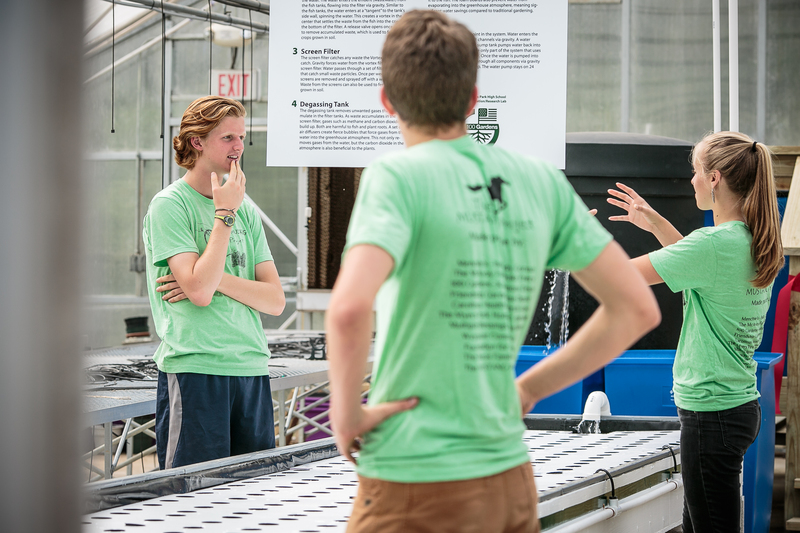 “The students learn leadership skills, life skills, and how to lead a sustainable lifestyle,” Brandy explains while giving a tour of the greenhouse. Four girls from the AS II class follow, excited to demonstrate their knowledge about both aquaponics and agriculture. Nadia Punt, a junior, points to the bright leafy plants by the wall. “The lettuce we grow is so good,” she says. “It’s the only lettuce I eat now!” Her classmate Kaley Anderson is more excited about the tomatoes, which sprouted up over winter break. They have also grown herbs for culinary students to use in their cooking classes. In order to take this coveted class, the girls had to complete Animal Science I, which focuses on the basics of farming, agriculture, and livestock. Along with a project focused on agricultural experience, each student can choose to join “Future Farmers of America” (FFA) and attend monthly meetings with other students and alumni of South Iredell. Though the class is simply another course listing on their transcripts, the girls are vocal about the impact it has had on their lives. Nadia, who moved to Troutman, North Carolina during high school, found a sense of purpose. “When I moved here, I struggled to find where I fit in. It wasn’t until I signed up for agricultural courses that I really found my niche.” Kaley, who lives on a farm, has used the skills and lessons from AS II to help her own animals. The course has inspired her to follow her dream of becoming a veterinarian. Madison McNew, a junior, is excited to see the future of sustainable living unfold, while Megan has a more humorous take: “The opportunity is incredible. We garden our own produce, we measure the fish, we feed the animals. Sometimes the goats even eat papers from our backpacks!” Homework-eating goats aside, the work that Brandy and her students do each afternoon is an incredible step forward is sustainable agriculture, and 100 Gardens is proud to be a part of this life-changing class at South Iredell. This greenhouse in Charlotte, NC looks ordinary from the outside. However, its interior hosts the very future of sustainable agriculture: a state-of-the-art aquaponics system. This cutting-edge community garden represents far more than advances in farming technology. 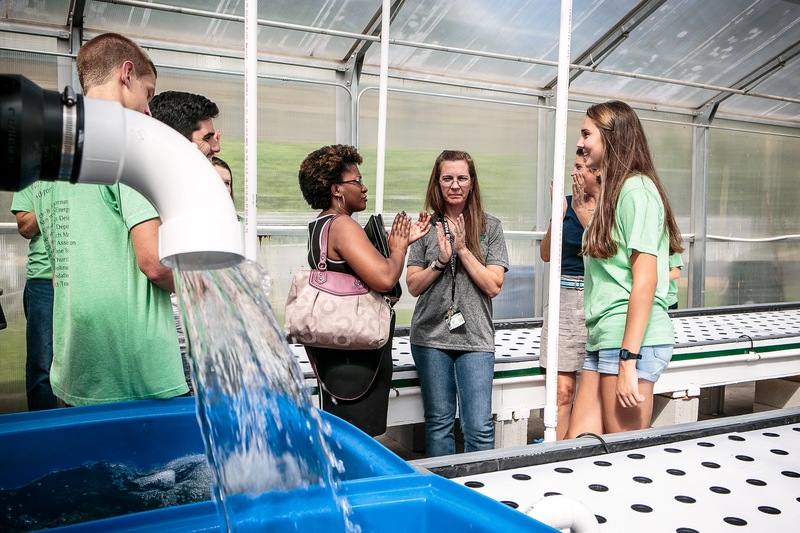 In fact, 100 Garden’s eighth aquaponics system represents the culmination of Myers Park High School students’ dream that took root in the school community and grew into something incredible. This is the Mustang Project. It started with a seed grant. After earning $4,000 to put towards seed purchases, senior Audrey and a few friends began an on-campus community garden, drawing in students from various grades with different interests. Stewart, a senior, remembers hearing about the garden from her biology teacher, while junior Julianna just wanted to get more involved on campus. 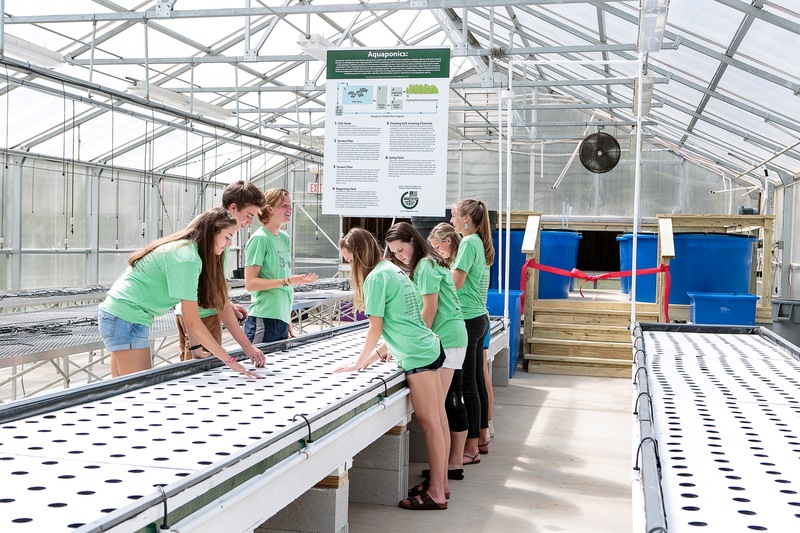 By January 2015, the growing group had a lofty goal: to implement an aquaponics system right on their school grounds (including four 450 gallon fish tanks, a vortex filter, a degassing system, and 224 square-foot floating raft growing channels). which can cost up to $10,000—a huge number for a group of high school students with limited resources. Fortunately, this number didn’t intimidate them. Instead, it fueled the fire in their fight. With guidance from 100 Gardens, the students set out to achieve their goal. The students set out to meet their goal of $7,000 in just a month, asking for donations from family, friends, and big corporate sponsors. 100 Gardens provided 3-D modules of aquaponics systems so that potential sponsors could gain a better understanding of the project. Donations rolled in quickly during the first week but then stopped. The students didn’t take this plateau in fundraising as a failure. They instead set up meetings with corporations. Myers Park senior Klaus remembers the enthusiastic atmosphere during their meeting with Duke Energy. When the company offered financial support, he and his classmates were thrilled. “That’s when I really thought we might be able to do this,” Klaus explained. By the end of the month, the students had raised $20,000—more than double what they had hoped to earn. It was time to bring the community garden to life. The group spent weekends designing and constructing the gardens, thanks to tool and soil donations from Black Hawk Hardware and Home Depot as well as help from the greater Charlotte community. The Street Art Club created two murals to put behind the raised beds while art classes made paintings to string from wires around the gardens as the finishing touch on April 20, 2015. The aquaponics system—built by Sam Fleming and Monty Thompson of 100 Gardens—would soon follow in August. Today, seventy percent of the harvest goes towards meals for students who qualify for free/reduced lunch. In addition, The Mustang Project is influencing the school’s curriculum by offering science students hands-on experience with a man-made ecosystem as well as inspiring paintings and poetry for art classes. 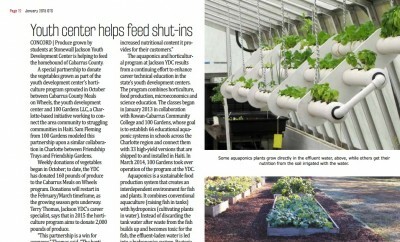 Looking forward, the aquaponics system will play a key role in students understanding the future of sustainable food. The Mustang Project proves that a seemingly impossible dream can come true when passion and hard work intersect. Luckily for Myers Park, the students behind the Mustang Project and the experts at 100 Gardens did just that, changing the school one plant at a time. BURGER REVOLUTION 3 IS HAPPENING MARCH 7, 2015 ALL OVER THE WORLD!!! AND WE ARE A PART OF IT!!! 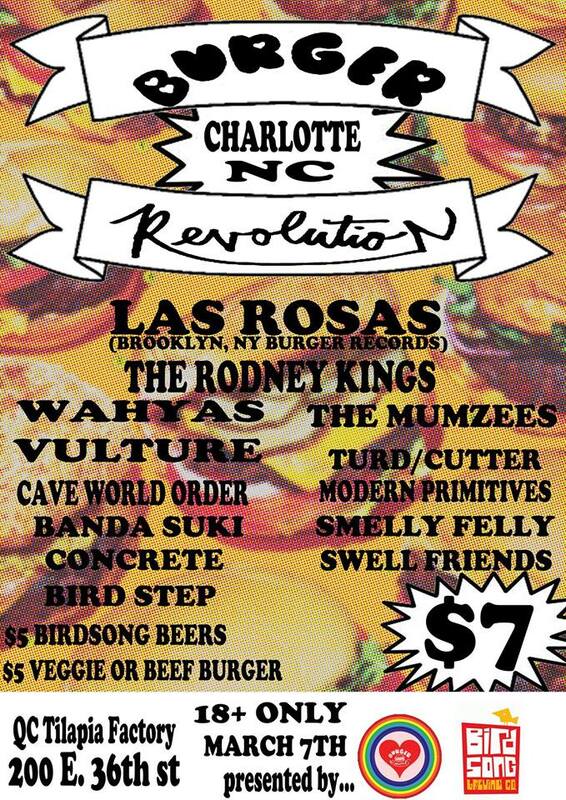 On March 7, 2015 Burger Records will be presenting shows across the globe as part of our third annual Burger Revolution world-wide party! locally raised, additive-free, grass-fed burgers. 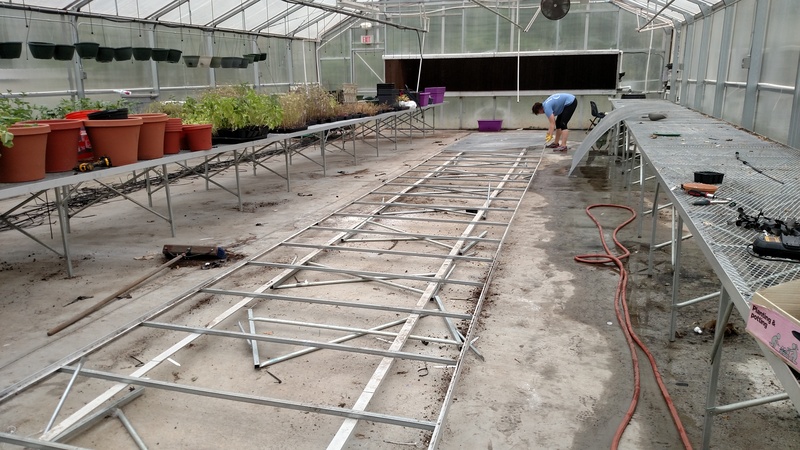 The aquaponics operation at Garinger High School has begun! Students will be managing and operating the aquaponics system that will produce 180 servings of leafy greens per week and 300 lbs of catfish for by next may for Friendship Trays. The aquaponic system will also provide hands on learning opportunities for the students. Ongoing costs and additional maintenance is providing by Friendship Gardens. The 100 Gardens Experiential Learning Development Team (Including teachers from Garinger, West Meck, CPCC and growing) is currently developing experiential learning activities that align NC essential standards with activities relating to aquaponics. This may include but is not limited to AP Environmental Science, Statistics, Functions and Advanced Modeling, World and US History, Visual and Graphic Arts, Culinary arts, Business and Marketing. This is an ongoing process and will evolve through collaboration. 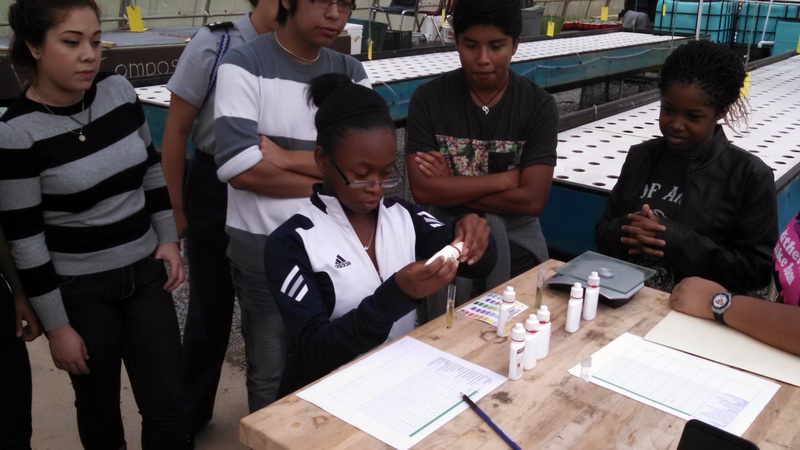 Students testing water quality parameters. Today the AP Environmental Science class, led by Nemal Patel, tested an recorded critical water quality parameters, recorded the amount of fish feed administered, and seeded 250 lettuce plants. Over the course of the year, several classes will perform activities that relate to their specific standards.